A Netflix-distributed, black and white movie in Spanish about a Mexican maid is on the brink of a potentially historic Oscars victory. Alfonso Cuarón’s Roma, already a critic favorite, is bringing up the rear in this exciting and turbulent awards race. Yesterday, it was crowned the Best Film by the British Academy of Film and Television Arts, or BAFTA. The movie also netted “mask” statuettes for Cuarón as Best Director and Best Cinematography and for Best Film Not In the English Language. A number of those trophies seem locked at the upcoming Oscars two weeks from today. But Yorgos Lanthimos’ devilish satire The Favourite did predictably well with the local crowd. The Queen Anne dark comedy netted the most awards of the night with seven, including Best Actress for Olivia Colman, Best Supporting Actress for Rachel Weisz, Best Original Screenplay, and Best British Film (along with three tech races in Costumes, Production Design, and Makeup). The movie showed that it has resilient support among the British voters in the Academy, which means it could still net out a couple of key wins with AMPAS later this month. Still, the fact that Roma triumphed over homegrown favorite – The Favourite – surely means that the movie is ahead at the Oscars where it does not have to face a movie with home field advantage. 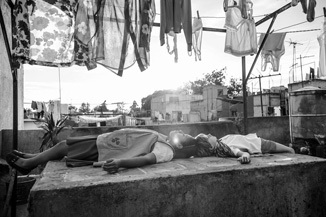 Moreover, Roma also beat Poland’s Cold War in two races where they will also face off at the Oscars and where the Cinematographers’ guild had made some noise last night by awarding their top prize to the Pawlikowski movie over the Cuarón drama. So, after all that, Roma is clearly the frontrunner. Or is it? One could of course argue that Green Book, which walked away with only one win at the BAFTAs, for Supporting Actor (Mahershala Ali), is a local favorite of sorts stateside. It tells a uniquely American story that was never going to resonate in England but clearly has a lot of support in the United States, as evidenced by its win at the Producers Guild Awards, the only guild in the entire precursor circuit to use the same balloting system as the Oscars. So, it surely is not over. What of the acting races? Colman has now made it a close race with Glenn Close. They split the Golden Globe and Close won the local SAG, with Colman taking her own local award, BAFTA. There is precedent for both winning, though the BAFTA seems more influential of late, calling wins for the likes of Meryl Streep and Marion Cotillard. Still, in this particular case, I have a feeling that Close remains ahead with a voting body that rightly sees her as overdue. A little bit of mystery also surrounds the Best Supporting Actress race. Regina King was not nominated by SAG OR BAFTA. The former went to Emily Blunt, who is not even up for the Oscar, and the latter, as mentioned, to Weisz. Who has the upper hand? I still think King is ahead, but one does wonder if there is room for something crazy here - Marina de Tavira?